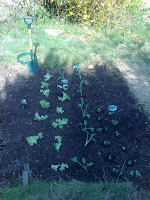 After having abandoned the garden more or less for the last 3.5 years, W and I decided that we would try to rescue the vegetable patch and grow some food. 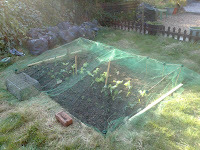 Last weekend W spent ages weeding and digging the patch. Today, we went to the garden centre and bought loads of seedlings, some compost, a spade and a few other bits and bobs. I have to say, I think it's looking pretty good!